United States, Los Angeles: February 25, At least a million residents awoke to air raid sirens at 2:25am., and U.S. Army personnel fired 1,430 rounds of antiaircraft shells at an unidentified, slow- moving object in the sky over Los Angeles that looked like a blimp, or a balloon. All radio stations had been ordered off the air at 3:08. The firing continued intermittently until 4:14. Unexploded shells destroyed pavement, homes and public buildings, three persons were killed and three died of heart attacks directly attributable to the one hour barrage. Several persons were injured by shrapnel. A dairy herd was hit but only a few cows were casualties. The blackout was lifted and sirens screamed all clear at 7:21. 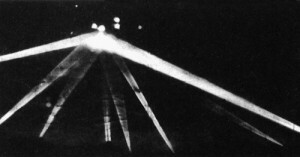 The photograph below show the object dimly as bursts of anti aircraft shells explode against its surface. The beams of light are earth based search lights focusing on the object which can just be made out. George Marshall wrote a memorandum to President Roosevelt about the incident, which remained classified until 1974. Marshall concluded that conventional aircraft were involved, probably “commercial sources, operated by enemy agents for purposes of spreading alarm, disclosing location of antiaircraft positions, and slowing production through blackout.” Despite the barrage of American antiaircraft fire, none of these “commercial” planes were brought down. Photographs showed shells bursting all around it. A Los Angeles Herald Express staffer said he was sure many shells hit it directly. He was amazed it had not been shot down. When the object finally moved, it proceeded at a leisurely pace over the coastal cities between Santa Monica and Long Beach, taking about 30 minutes of actual flight time to move 20 miles; then it disappeared from view. Soon thereafter US Navy Secretary Frank Knox announced that no planes had been sighted. The coastal firing had been triggered, he said, by a false alarm and jittery nerves. US Army General, Leslie Groves [Corps of Engineers], finishes building the Pentagon and moves on to be military director of the US Manhattan Project, i.e. the US atomic bomb development project. In July, Roosevelt restructures COI into something more suitable for covert action, the Office of Strategic Services (OSS). Donovan recruits so many of the nation’s rich and powerful that eventually people joke that “OSS” stands for “Oh, so social!” or “Oh, such snobs!” UK’s MI5 played a major part in the creation of the American Office of Strategic Services (OSS). The OSS was modelled on MI6/SOE; American personnel received training and instruction from British agents. OSS later came to concentrate predominantly on armed subversion and guerrilla warfare and was the forerunner of the CIA. The Signal Security Agency, forerunner of the National Security Agency (NSA), worked closely with ITT Communications, RCA Communications, and Western Union Telegraph Company to gain unlimited access to the cable traffic of private citizens, companies, and governments. The operation came to be known as Shamrock. Secretary of War Henry Stimson created the War Research Service (WRS) to oversee the establishment of an American biological warfare program. Headed by George Merck, president of Merck Pharmaceutical Company, the function of the WRS was kept secret through the war. By 1943, at the request of the WRS, the Army Chemical Warfare Service began building specially designed laboratories and pilot plants at Detrick field. Timor Sea. The cruiser Tromp was approached by a large aluminum disc that flew at tremendous speed. It then circled the Dutch vessel for about three to four hours. Finally, it flew off at an estimated speed of 3,000-3,500 mph. Solomon Islands. While in the Solomon Islands US Marine Corp Sgt. Stephen J. Brickner sighted a staggering number of UFOs, laid out in virtually an enormous rectangle. The formation was 15 craft long and 10 deep. Formation sightings have been reported before but the rectangle shape is unique.